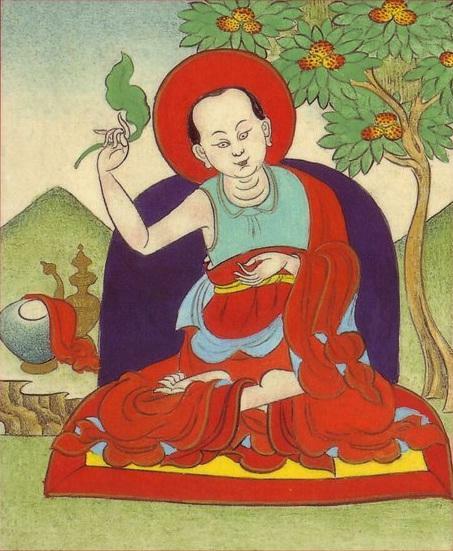 400 Verses on the Middle Path by Āryadeva (c. 3rd century), one of the fathers of Madhyamaka philosophy of Mahāyāna Buddhism and the main disciple of Ārya Nāgārjuna. while the real situation is that he will definitely come?! not as though you were going to live. it would seem as though you should cry out in fear at the obvious. when it ravages someone (else)? you should fear what is grossly obvious. (we’re) like cattle about to be slaughtered. how can you not fear the Lord of Death? the Lord of Death is going to ravage you. you were smart (and knew) your own nature? You have (simply) pawned yourself (for a future karmic debt). of clinging to a "self," as are the wise (Arhats). but (a phenomenon that passes from) moment to moment of the mind. But beings have not ascertained this and are thus unaware. To be certain of this and know your own nature is rare. only to ordinary folk like yourself. why do you (grieve) about (the death of) your children? why should you not be ridiculed (by the wise)? as well, without asking (permission). but his desire to depart is demonstrated by his old age. but (to his son) he does not generate similar (feelings). goes to a worse (rebirth). For this reason, birth in a higher status is difficult to find. When (a son) is disobedient, no one would call him adorable. (in exchange for) a certain cause, as in a business transaction. quickly wanes from people’s hearts. and this, in addition, is unjust to yourself. wander about (from one birth to the next). who will (only) bring you suffering (when you have to part)? why isn’t there (the same) happiness at parting? Don’t gathering and parting come one with the other? even though it’s for so much longer? (by robbing your life) act as an enemy. for these things that act as an enemy. will be enacted to you as your sentence (by the Lord of Death). so what advantage is there in having attended to it? even for the Lord of Death?